Adani Ports has agreed to acquire Dhamra Port in Odisha from Tata Steel and L&T Infrastructure Development Projects (L&T IDPL) for about Rs 5,500 crore. "The Dhamra port acquisition now gives us an opportunity to replicate the development and phenomenal growth of the Mundra port on the eastern coast of India and thereby continue to execute on our pan-India strategy," Gautam Adani, Chairman of the Adani Group, said on Friday in a statement. An equal joint venture between L&T IDPL and Tata Steel, Dhamra Port Company Ltd (DPCL) was commissioned in May 2011 with an 18-km approach channel and a dedicated 62.7 km rail link to Bhadrak. 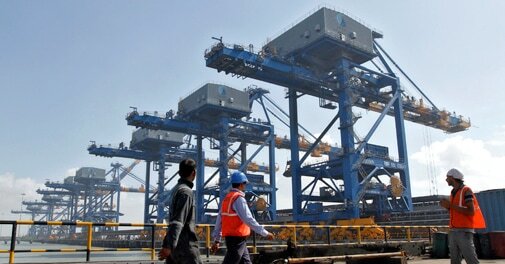 The port handled 14.3 million tonnes of cargo in the previous financial year. DPCL, the operator, had been awarded a concession by the Odisha government to build and operate the port on Dhamra river in Bhadrak district for 34 years, including four years for construction. The concession period may be extended by two additional terms of 10 years each. The first phase construction, at an investment of Rs 3,200 crore, started in March 2007. Following the acquisition, the second phase of development will be initiated within 90 days and completion targeted in 30 months, Adani Ports said. "The expansion will allow the Dhamra port to exceed 100 million tonnes of cargo capacity by the year 2020 and therefore allow Adani Ports to fulfil its stated vision of becoming a 200 million tonne ports business well before the year 2020," it said. Adani Ports is country's largest port operator with its flagship Mundra Port in Gujarat being the largest commercial port in India. "As part of Tata Steel's review of its investments portfolio, board of the company has approved the divestment of its equity holding in the joint venture at an attractive valuation," Tata Steel said in a separate statement. Tata Steel has entered into a long-term cargo handling pact with DPCL to secure long-term requirement and access to a deep-water port for its operations in Jamshedpur and Odisha, it said. The transaction is subject to customary conditions precedent including lenders and third-party approvals.